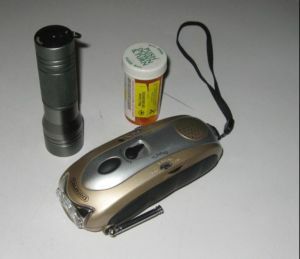 Flashlights, medications, and self generator radios pay long term benefits during an emergency and should be incorporated into an emergency kit. Communication devices like whistles and signal mirrors allow for long distance notification for emergencies. Prepaid phone cards and cash in small denominations should be included in an evacuation kit. Dry food like granola bars or jerky allow for quick energy source when on the move.